These Clean Eating lunch ideas are for people like me. I eat lunch alone and I’m lazy and it has to be easy. Hello! I have a huge problem. It’s finding different things I can eat for lunch. I am home alone for lunch every day except on the weekends. I eat clean which means I can’t eat out a lot because there just aren’t restaurants that are totally clean. Besides, I don’t have the time to go out to eat or the funds. My mother and my sister have the same problem. My mother works from home all day so she is home alone for lunch. She hates to cook and doesn’t like to spend hardly any time cooking because it takes away from her working or playing time. My sister has 2 pre-schoolers at home. She doesn’t really like to eat what they do and has the same dilemma as my mother and I do. To add to the problem my mother, sister and I have to eat gluten-free and/or dairy-free AND/or sugar-free. Depends on which one of us you are talking about. We always try to eat clean. That doesn’t leave a lot to eat, so you see what our problem is. To say the least, we find that we eat the SAME THING (seriously) EVERY SINGLE DAY. We’re tired of it and we want options. We thought that some of you might have the same problem. So I went on the hunt for things we could eat for lunch. I thought that I could share what I found with hopes that I can help some of you and myself and my mom and sister at the same time. The other important stipulation is that these Clean Eating Lunch Ideas and/or recipes have to be easy. Don’t forget they have to all be clean too. Easy and clean don’t always mix together very well. That’s another reason it’s so hard. You won’t believe what my mother used to eat for lunch every day until she got so sick of it. She wanted to throw up just thinking about it. You’ll never ever guess. She would open a can of tuna fish, put it into a bowl and mix applesauce into it. The applesauce moistens it so it isn’t dry. She can’t eat mayo so that’s what she came up with. Actually, it doesn’t taste that bad. One time she tried mixing banana with tuna fish instead of applesauce. That was just nasty. Don’t ever try that. I don’t think I need to worry much about that. The other thing is that I think a lot of people probably have sandwiches for lunch. So, for this post sandwiches are OUT. Especially for us gluten-free eaters. I don’t think anyone needs ideas for sandwiches. That’s all a lot of people eat for lunch, I think. I know a lot of people eat leftovers for lunch. That isn’t an option for us either. We have a histamine intolerance and leftover meat is the worst thing we could eat. The Histamines grow on the meat while it sits in the refrigerator. But I know that isn’t a problem for a lot of you. I want to share some of the Clean Eating Lunch Ideas my Mom and sister eat for lunch. Even though we are tired of them you probably aren’t and might like to try some of them. Hummus with baby carrots and/or gluten-free corn crackers and an apple on the side. Frozen salmon patties from Costco. Mom fries the salmon patties in coconut oil. When the patty is half cooked, she turns it over and adds cooked brown rice and it gets fried up in the coconut oil. She eats fruit on the side and sometimes sunflower seeds for the vitamin B6. A handful of spinach with a can of tuna or canned chicken or a salmon patty on top with avocado instead of dressing. You can have dressing if you want. Quesadillas made with my Easy 4 Ingredient Spelt Tortillas cooked in a quesadilla maker. Put cheese inside or anything else you desire. Fruit on the side. The quesadilla maker cooks both sides at once so it’s quick to cook. She cuts in up with a pizza cutter. My mom makes what she calls burger bowls. She cooks a little ground beef in the microwave, adds is to cooked brown rice, adds green peas cooked in the microwave and puts my Chimichurri Sauce on top. My Mom buys a can of salmon from Costco, mixes it with an egg, some salt and pepper. You can add other spices or things you want like onions or peppers. Then she fries it in some coconut oil and eats it with cooked brown rice. Half a can of salmon is enough for one patty. This work well with tuna also. My mom likes to cook brown rice in her Instant Pot. She cooks 2 cups of rice at a time which makes about 4 cups of cooked rice. She adds 3 cups of water and cooks it on manual for 25 minutes. It can sit there after it’s done cooking for up to half an hour without hurting it. She keeps it in the refrigerator and gets what she needs each day for lunch. It will keep in the frig in an airtight container for about 10 days. You can also cook jasmine or basmati rice in the Instant Pot. Specific directions are in the cookbook that comes with the Instant Pot. My sister buys a can of chicken from Costco and mixes it with greek yogurt instead of mayonnaise. She eats it with clean tortilla chips, grapes or some other fruit on the side. Sometimes she’ll have a little more greek yogurt on the side if she is still hungry. I used to eat that all the time but instead of greek yogurt I mixed it with My Homemade Paleo Mayo Recipe instead of greek yogurt. I eat My Clean Eating Spelt Tortillas made with either spelt or einkorn flour. I eat it with uncured ham, cheese and My Homemade Paleo Mayo Recipe mixed together. I eat it with spinach and clean tortilla chips and clean salsa on the side. You can buy uncured ham at Costco, Target or Good Earth. Look for it in health food stores. It’s getting fairly common now. Cured ham has histamines in it. I buy my clean salsa at Good Earth. I used to eat a BLT for lunch every day. Technically that’s a sandwich but I wanted to mention it because it might be a sandwich some people might not think about. I love bacon, so that’s where that came from. 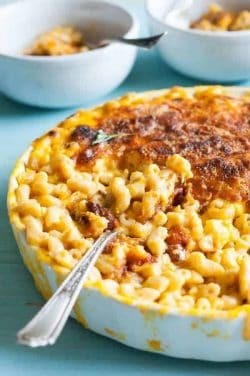 A couple of these recipes, like soup or chili, I suggest making it one day and then eating it leftover for a couple of days after that or freezing them in portion-size containers and warming them up in the microwave. I know what I said about bread and I still agree but I liked this recipe. I found another I liked better but the blog had a picture on it I don’t ever want to see again. I thought I’d spare you seeing it to. I decided to use this recipe and tell you to put it in a pita pocket (that’s the only reason I like the other one better). That’s technically not a sandwich and less carbs too. The pita pocket would actually hold more of the eggs inside and it would be less messy too. I think it would be good with some sprouts inside the pita too. I like this recipe because it doesn’t call for mayonnaise. The avocado takes the place of the mayo and I think that’s a great way to go. Avocados are actually very moist. It doesn’t need mayo. My mom doesn’t eat salad dressings so she always puts avocado in her salad and it replaces the dressing nicely. A boiled egg will keep inside the frig for a long time, at least a week. Boil several then when you want this egg salad, it’ll only a couple of minutes to make. I remember my Grandma used to make these once in a while. I’ve seen them made with canned salmon too which is even better but more expensive. Bottled mayonnaise from the store isn’t really clean so make a batch of my homemade mayo and use it for the Aoili recipe stead. Homemade mayonnaise will keep in the frig for quite a while plus it just takes 5 minutes to make it. My grandma didn’t ever put peppers in her croquettes so if that’s too much bother, don’t worry about it. Sometimes I use dried onion when I just need a little bit for something like this. Well, if you didn’t already know. Avocado is the new mayo. That’s right, now we have tuna mixed with avocado in place of mayonnaise. It’s absolutely delicious, easy peasy, ready to eat in about 5 minutes and healthy to boot. Ya, I know that’s what my grandmother always said, I can’t help it. Don’t pay any attention to the brand of tuna they are trying to sell. Buy whatever tuna you like. If you want this to be easier you could absolutely just leave out some of these ingredients. You could use a can of chicken if you don’t like tuna. I love pesto on anything so I think this would be a really good quick lunch to make. You could buy a bottle of pesto then it would be really quick and easy to make this. Serve it with crackers or on toast if you want to. It’s also good by itself and always good with a side of fruit. This chicken can be easy if you want it to be. You just have to be creative. Personally, I would open a can of chicken I buy from Costco. You could use leftover chicken, a rotisserie chicken or you can cook chicken pretty quickly in an Instant Pot. To cook chicken in an instant pot I put a whole bag of frozen chicken tenders in the pot. I push the poultry button and then the plus button 3 times so it is set for 18 minutes. I like to put enough for a single serving in bags and then I keep them in the freezer. When I want them I just defrost them for a few seconds in the microwave or if I remember I put the bag in the frig in the morning and it’s thawed out by lunchtime. I like the idea of putting the chicken salad on lettuce shells rather than bread. 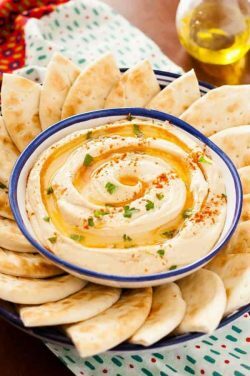 It can also be used as a dip for veggies or plantain chips or crackers. It’s time to start thinking about what to do about school lunches. I have a lot of suggestions for Clean Eating lunch ideas and recipes. I tried to include ideas that are not too messy for kids to eat and can be eaten quickly. Also included are recipes that don’t need to be refrigerated plus are Clean Eating that kids can take to school. 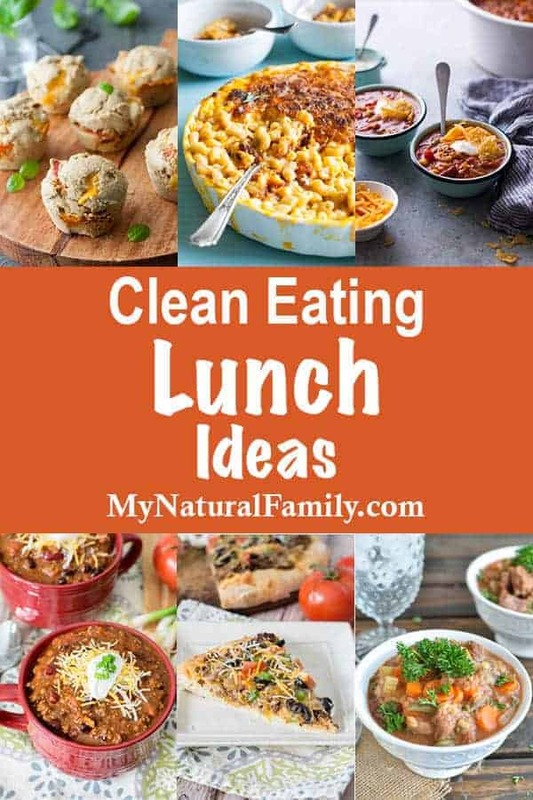 I have Clean Eating lunch recipes for simple meals and snacks that can be combined to make a great lunch for a lunch box. Most of them you can make ahead so they are ready to just pop in the lunch box. Some you may want to make for dinner and put the leftovers in your kid’s lunch box the next day. Sometimes kids are picky eaters and I’ve found that they would rather have some of this and some of that and not too much of anything. I know some kids that don’t like anything mixed together so I purposely included recipes that aren’t mushed together – no casseroles here. Kids really love finger foods, so I have included a lot of Clean Eating finger foods. Finger foods are great for kids – but you might want to include finger wipes for them to clean their hands before they eat them. I also have links to some lunch box supplies at the bottom of the post that have been helpful to me. If you do find that you need something to keep the lunch box ingredients cool, the freezer pack is great. Have fun this year sending your kids to school with a great lunch box meal that will help them stay healthy clean eaters. Sweet Potato – Lemon Juice – Coconut Butter – Strawberries, Raspberries, Blackberries, Oranges or other fruits depending on the flavor. The idea for making these came from the Happy Creamies they sell at Target. Although these skittles are not quite the same, kids still love them. They are easy to pop into your mouth, carry in your purse or keep in the car. They are as convenient as raisins. They don’t need to be stored in the refrigerator. There are several different recipes here for the different flavors. Kids love anything with hot dogs in them. Now you can make them pigs in a blanket and they can eat healthily. Yes, clean hot dogs really do exist, see the link above. That makes this recipe super easy. These are similar to a mini quiche. 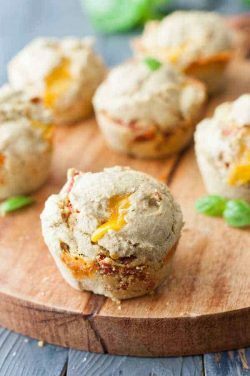 They are filled with tuna, cheese and sweet onion. They are great hot with potatoes or on top of a green salad. They can be tucked into lettuce wraps and tartar sauce is good with them too. They can be reheated beautifully so you can make a double batch if you want to. They work really well frozen too. 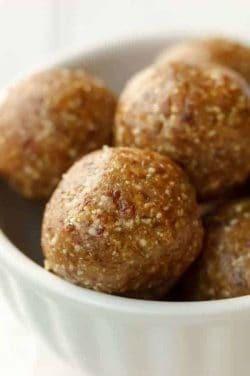 This is easy to make, contains no refined flour and sweetened naturally with honey. Great if you’re trying to cut out refined flour in your diet. I think pizza is really good cold. This is an easy version of whole grain homemade pop tarts. These are super easy to make and everyone loves them, not just the kids. These are kind of a marriage between pop tarts and toaster strudel. This is the clean eating homemade tortilla recipe you’ve all been looking for. It can be used so many different ways. You can use it for wraps, tacos, enchiladas or quesadillas. They are so easy to make. This are my favorite lunch box containers. They fit good together with each other and they fit good inside of lunch boxes. They are sturdy and rather inexpensive. You can see through them to know what is inside without taking the lid off. I like this lunch box for boys. It has two compartments. The one on the bottom has a hard case so that sandwiches won’t get smashed. It also has a thermos to keep foods either warm or cold. I like this lunch box for girls. It comes with a water bottle and they can either use the shoulder strap or the handle. It’s from “Frozen” what little girls doesn’t love Elsa and Anna? These lunch box containers work well too, they are just less expensive the the Rubbermaid ones and probably won’t last as long. If your child is always loosing their containers then these might be a better option. It just depends on your situation. These storage containers are good for small items. So if you give your child several different small items for lunch, these would be a good option. These containers are meant to be disposable and only be used once and thrown away. But they can totally be washed and used many times. They are a very inexpensive option. There packs are awesome. They have blue ice inside that can be put in the freezer and frozen. Then when the kids leave for school you can put them inside of their lunch box. They will keep food cool for several hours. Therefore I you can put meat in their lunch and it won’t spoil before they eat lunch. It’s like a little mini refrigerator. They can be used over and over again. Aren’t they so cute? The kids will love them. 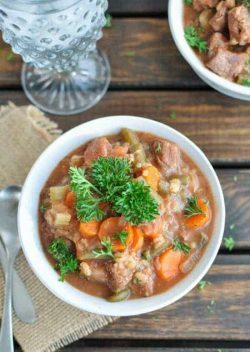 This slow cooker beef and barley stew is so easy to throw all the ingredients in the morning and forget about it the rest of the day and have your entire healthy, comforting meal in one bowl! 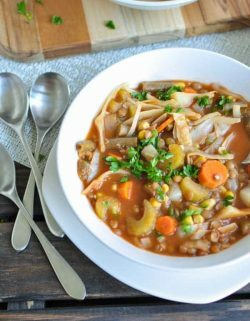 This simple, healthy lentil vegetable soup is packed full of nutrients and veggies and is hardy enough to be served as a meal. The entire family will love it! 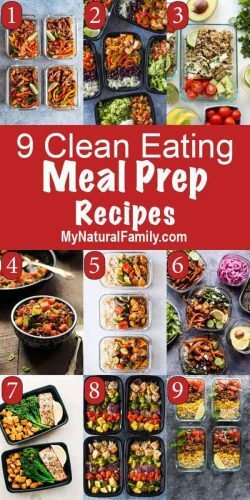 These 9 clean eating meal prep recipes are great for lunch or dinner. Simplify your life, make meals faster and easier and healthier at the same time. 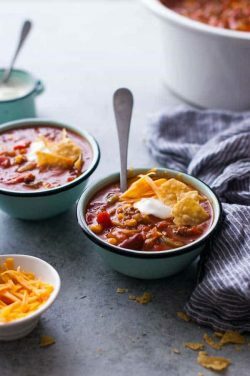 I love how easy it is to throw this Clean Eating chili recipe together. You literally just dump in a bunch of cans of food and add some seasoning. My kids love this chili, especially on Navajo tacos. 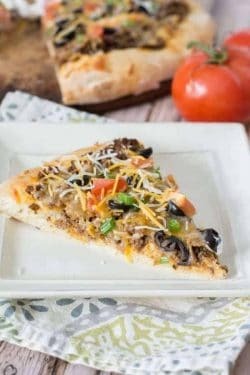 I love this Clean Eating taco pizza with spelt pizza dough! It’s a lot healthier than pepperoni and my kids love it.